Start in Philadelphia and take I-76 (a.k.a. Pennsylvania Turnpike) across the state from east to west, which goes all the way to Pittsburgh and beyond into Ohio. On its own, Philadelphia has plenty to do, like Independence Hall, the Liberty Bell (one of the best free tourist attractions in any state), and Reading Terminal Market, so you may want to first spend a few days exploring the city. Next, add a guided tour of the Pennsylvania State Capitol in Harrisburg to your road trip planner (though you may want to make a detour before that for roller coasters at Hershey Park). 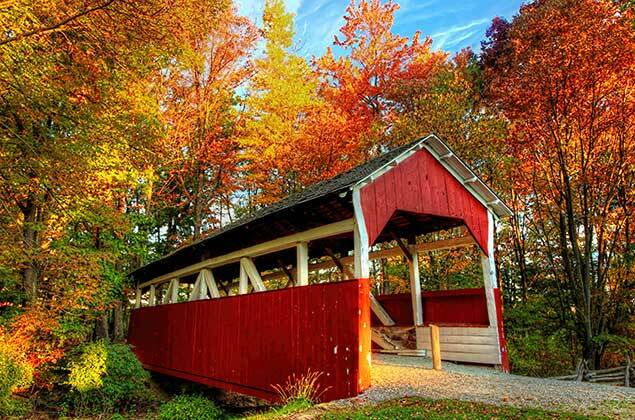 Continue west to Somerset for hiking at Laurel Hill State Park and exploring covered bridges, like Walter&apos;s Mill Bridge. Finish up your road trip in Pittsburgh, which is home to world-class art museums, like The Andy Warhol Museum and the Carnegie Museum of Art, as well as a variety of distinctive neighborhoods.